"I have heard '30 FPS looks like a movie, while 60 FPS looks like a camera man following you around' so much from so many console gamers." "It is true that most of people can't tell the difference between 30fps and 60fps unless they see a 30 fps and 60 fps video/game running at the same time. I'm wondering how many of you can instantly tell the difference just by looking at it for the first time?" 30 FPS VS 60 FPS is a hot topic recently. And many people want to figure out the certain answer about which one is better: 30 FPS or 60 FPS. For making everyone more clear about 30 fps and 60 fps, here, we compare 30 FPS video/gameplay side-by-side with 60 FPS video/gameplay. Note: FPS, is the abbreviation of Frames per second, used for measuring the frame rate in a moving image. There are three main frame rate standards in the TV and digital business: 24p, 25p, 30p. With the development of technology, many newer variations come out including 48p, 50i/60i, 50p/60p, 72p, 90p, 100p/119.88p, 144p, 240p and 300p. For knowing more about 30 FPS VS 60 FPS, you can use a functional frame rate converter to adjust video frame rate: MacX Video Converter Pro. It can help users effortlessly change video frame rate from 60 FPS to 30 FPS, 30 FPS to 24 FPS, etc as well as other video parameters like resolution, aspect ratio, bit rate, etc. parameters for later comparison or fluently playback. What is 30 FPS? As is known to all, 30 FPS is a progressive format and produces video at 30 frames per second. Common movies and TV shows are usually shot in 30 frames. What is 60 FPS? 60 FPS is a progressive format which is used in high-end HDTV systems. Beyond question, game players may know the answer of 30 fps VS 60 fps earlier than those who have rare time to play video games. Because, in most cases, 30 fps is broadcast, 24 fps is film, and 60 fps is some games, some rare broadcast, and some blue-ray. 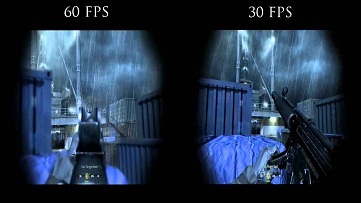 In terms of games, some games use both 30 FPS and 60 FPS in different scenarios. Although only a few games will use 60 FPS so far, console gamers are confident that they can eyes tell the difference between 30fps and 60fps in gameplay. Actually, to judge which looks better: 30 FPS or 60 FPS, the considerable factors should include video quality and the smoothness of playing. It is generally believed that the 60 FPS game will look smoother and clearer than the 30 FPS game, for example, Dirt 3, Battlefield 4, Minecraft, etc. In a word, higher FPS is better than lower. Of course, 60fps is not favored by everyone. Some people would like to choose 30fps rather than 60fps videos/movies/games because they believe 30fps is more realistic and natural. After reading the comparison between 30 fps and 60 fps, you may be eager to download 60 FPS gameplay videos ASAP for freely playback on computer, TV, iPad iPhone or Android devices. Fortunately, the above MacX Video Converter Pro also has a strong ability to get 30 FPS/60 FPS videos download from YouTube, Vimeo, DailyMotion, Vevo, Facebook and other 1000+ online video sharing sites with high quality and fast speed. Furthermore, built in 350+ preset profiles for Apple and Android devices, free YouTube downloader Mac is capable of converting downloaded 30 FPS or 60 FPS videos to devices directly for replaying on the move, for example, iPhone Xs Max/Xs/XR, iPad Air 2, iPad Mini 4, Apple TV 4, iTunes, iMovies, Samsung Galaxy S9, Xperia Z1/ Z2/ Z3, PS4, etc. Now, forget the fight of 30 FPS VS 60 FPS, follow the below steps to free download YouTube 60 FPS/30 FPS videos. 1 Free download and run this 60fps YouTube video downloader. Click "YouTube" icon to enter the download interface and paste your desired 60 FPS video URL. Then click "Analyze" to load video details. Alternatively, you can click "Paste & Analyze" button and the software will automatically detect the video details. 2 Choose video format (MP3, MP4, etc), resolution and file size that you desire for the downloading 60 FPS Gaming Video. 3 Click "Browse" to specify an output folder on your computer to save the downloaded game video. 4 Hit "Download Now" to start the 60 FPS Gaming Video download task. By the way, you also can download.